Julie Stanford: Good and bad customers. As many consultants know often the quickest way to rescue a business is to look very closely at the customers and then say goodbye to some of them. I’m Julie Stanford and a while ago I presented a radio show for Radio Reverb in Brighton. What my guests talked about then is still very relevant today. In this show my guests are Ed Carr and Ray Richards and we talk about good customers and bad customers. Welcome back to both of you. Julie Stanford: Now this is a natural extension of last week’s show where we touched upon win-win with customers. Ray you were talking a lot about that last week and it was really fascinating, so actually I wanted to think this week, well actually I think the topic’s for this week’s show is a good topic is bad customers, good customers. Is there such a thing as a bad customer, how do we find out who they are and if we have them, what do we do about them? So Ed, do you mind if I start with you. Julie Stanford: First of all, before we launch into the topic, I do like to find out what’s going on in business, so how are things? Had a good week? Ed Carr: Yes, it’s been a very good week. We’ve got lots of good customers because we’ve managed to restrict the numbers of bad customers, so it’s actually, in the world of marketing, it’s been a very good week, yeah. Julie Stanford: What about you Ray? Ray Richards: Yeah, good week so far. Where are we? Friday afternoon? That’s pretty much all of the the week, isn’t it? Yeah, it’s been okay. What makes a bad customer? Julie Stanford: Right. Okay. Let’s think then about these customers. When I first started business, I thought that customers were everything, that every customer that happened to wander into my office or studio I had to keep them. I didn’t understand how to determine the difference between a good customer and a bad customer. First of all, am I right in thinking there is such as a thing as a bad customer? Ray, what do you think? Julie Stanford: You said that with such conviction. All right, so Ed you would agree? Julie Stanford: I think that’s a first that we’ve got absolute agreement on the show. Right, so now that we know that there is such a thing, because actually some businesses will not think that there is, so that might be … I’m sure that they’ll have feelings about their customers, but in terms of the profitability for the business really is what we’re thinking about, there still is such a thing as a bad customer. How would we determine what that bad customer is then, Ray? Ray Richards: Well, I think it follows on from last week really. A bad customer as far as you’re concerned is somebody who is not profitable and has no potential to become profitable, somebody who you don’t like and, as far as I’m concerned, if you’ve got a customer who’s really upsetting your staff and is not behaving with integrity or is just a plain idiot, then get rid of them. You know? It’s not worth it. You’ve got more of a duty to your staff than anybody else arguably. If they’re not playing ball and you don’t like them, fire them. Julie Stanford: Which is great unless they’re your most profitable customers. So say for instance we’ve got a really unpleasant individual or group of people or whatever, whatever constitutes a customer, and they drive us crazy. They’re demanding, inflexible, overbearing, but they are wonderfully profitable for the business. That’s when it becomes a more complex issue, isn’t it? Ed, what would you say? Have you had customers like that? Ed Carr: Yes. I’ve had customers exactly the sort that Ray’s described and some of them wrapped up all in one person. Julie Stanford: Tell me later. Julie Stanford: I think he might have quite a lot of unhappy customers. Ed Carr: Has he learned from them? Julie Stanford: Given one of the operating systems. Ed Carr: There’s a separate show there, isn’t there really? In terms of how you run your business, there’s a lot to be learned from that. You’re learning all the time about what your business will be this time next month, next year, by analysing how your customers relate to you and how good they are or bad they are. I have friends who, for example, start the year, I think somebody you know as well Julie and he’s told the story to you, he starts his year by going into work the week between Christmas and New Year, goes back through his books and finds out who his worst customers are and he phones them in the first week of January and slowly and delicately and professionally sacks them. He gets rid of them and explains to them, look, this isn’t working for either of us. We’re making no money out of you but that’s because you don’t value what we do. You’re better off going somewhere else. So, it’s done beautifully and elegantly, but it’s still done and he’s worked it out on a basis of trust, honesty and value. Julie Stanford: So, great, but again, that’s still that customer that isn’t profitable and I wonder if it becomes so much more difficult when say, for instance, they’re bringing in 40% of our revenue or something. Ray Richards: I think you’ve got to be pragmatic about it. I think you’ve got to be really pragmatic and if you’ve got what you consider to be a bad customer and they don’t value what you’re providing, you just don’t like them, they’ve got a different set of values to you, so they’re bad customer, but they’re a good customer in that they’re profitable. Then, it’s difficult, but what you have to do is you have to be really brave and you have to go out there and you have to win other customers and so your reliance on that one customer becomes less and less. The problem is sometimes the customer ends up with you over a barrel because if you lose that customer, you’re dead. Your business folds and if you ever get into that position. Well, first of all, don’t let yourself get into that position. Be really careful. Do not have all your eggs in one basket. I always say to any client, if you can lose your top three customers and still break even, you’re doing all right. Julie Stanford: So you would advise them to position themselves so that they can withstand any of those customer leaving shocks? Ray Richards: Absolutely, absolutely. If I go into a business that’s already the largest customer accounts for maybe 50% of their business and if they lose that, that’s it, they’ve got to shut up shop, then it’s a really difficult position and what you have to do is you just grin and bear it for a period while you go out there quite aggressively and win other customers so that the reliance of that … Be brave about taking on more business with that customer because the problem is when you’ve got one big customer, they pick up the phone and everybody jumps. It becomes, it’s not a good relationship. Julie Stanford: No, it’s imbalanced, isn’t it? There’s not a good balance. Ray Richards: Yeah. It’s a sort of bullying relationship. Julie Stanford: I remember many years ago, one of my first really big shocks in business because Ed will know, I am a bit of Pollyanna and I did everything I could to keep everybody happy and the clients. I’m sure the staff hated me because I put the clients first which, as you say, probably not the thing we should be doing always. The staff have to come first I think. But there was one particular client who I just thought, they gave us masses of work, everything was going great, until I became quite friendly with one of their staff, more friendly than I had hitherto, and she took me aside one day and said, “I need to tell you something because it’s upsetting me. That in the last staff meeting one of the directors said to us all if you can find someone who delivers the product as beautifully as Julie for less money, you’ll win £500” or £100 or whatever it was. I was deeply shocked because I had felt that we were a partnership, that we were working together to produce brilliant products for them and to have found that out destroyed my faith in that customer and I stopped giving them 100%. I did because I just thought, well, if that’s how it is and I didn’t know. I felt a bit stupid. Ray Richards: Did you keep the customer? Julie Stanford: Yes, I did, because I had to because they were a big customer. Ray Richards: You gave them less than 100% and they still stayed with you. Julie Stanford: Yes, I did. Yeah. Ed Carr: Did they notice the difference? Julie Stanford: But I knew and it was interesting. Ray Richards: So it became more of an equitable relationship, really. Julie Stanford: Probably, yes. Actually, yes. Ray Richards: That’s the one. Julie Stanford: That’s true, but it is that thing of would you say that was a bad customer. They were profitable. The staff were great. They came, they worked really well with us, but it way that one key person who I had felt valued what we were offering, it turned out put money before relationship. Ed Carr: Don’t forget your customers, of course, are looking for you to supply a business product. They want something that works for them in terms of whatever commodity, whatever service you do. Sometimes I think we actually confuse our personalities, particularly in the service industry with what we have to supply to our clients. Our clients look to us to make them richer. Julie Stanford: That’s a good point, Ed. Ed Carr: Whether we’re nice or nasty or somewhere between those two points on a matrix, is not immaterial, but ultimately not as important as you delivering something to them which they can actually make money from. Ray Richards: I think that’s the point. Ray Richards: I think that’s the point because the business owner probably in the example you gave was the one who was looking … Because he didn’t have a relationship with you probably. Oh, he did. Ray Richards: All right, but he didn’t care. He didn’t care really. He was looking at the bottom line. The people that worked for him did care because they probably enjoyed working with you. They felt they had a relationship. The fact that either they couldn’t find somebody who provided it at the quality or if they did find somebody who provided it at the quality they couldn’t get it at a cheaper price. It was either that or they didn’t go out looking because they didn’t want to lose you as a supplier. I think an accountant, because it’s usually an accountant saying we need to cut costs is one thing. People going out there and actually making the decision, because they know actually they’re getting good value for money because you understand their business. Your problem is when you swap a supplier you have to explain the whole goddamn thing to them again. I can take a year sometimes or longer for the supplier to really get up to speed and understand your business, particularly in a design environment. It’s not as simple as the accountants make out. Julie Stanford: No, it isn’t. Ray Richards: I just think the relationships can add so much value, but it’s not necessarily quantifiable. Julie Stanford: I suppose it’s the person who’s making the decision as well, isn’t it? It’s if the FD is making the decision and they’re driving the way that that company is working with you, then it’s obviously going to be focused on profitability and value for money and all of that, whereas there might be other people who will take a longer view and might be thinking more about the ease of working, how responsive you are, how creative you are, whatever. Ray Richards: If you’ve got good relationship with somebody, they’ll come back to you as a supplier and say, “Look, I’ve got this problem. I’ve got to be seen to be reducing costs by 20%. What can we do?” You’ll find a way. Ed Carr: It’s how partnered you are with that individual. Ed Carr: If it’s a partnered relationship that based upon a long-term understanding what you each mean to the other, it’s much more likely to endure because they’ll come back to you. It’s a conversation, particularly in the service industry. It’s like any relationship. It is dependent upon communication and compromise and that partnership is vital to the survival of that relationship. Ray Richards: They don’t want to lose you and you don’t want to lose them. It’s as simple as that. Ed Carr: That is what you want. Julie Stanford: Going back to the customers then and thinking, if we had this customer that we talked about earlier, this mythical person who was bringing in lots of money but they were not behaving well with your staff, would you go and talk to them about it? Ray Richards: I think you have to be brave, but you also have to be comfortable with what the downside of that could be and it could be that it gets worse. Julie Stanford: Or that you could lose them. Ray Richards: Ultimately you could lose them and you could lose them on the day you have that conversation. If you’re prepared to accept that and you’re prepared for the risks, then do it. I think ultimately a conversation with somebody, if you handle it in the right way and you don’t go in there and start waving your finger at them and you just have a good honest open conversation about what’s happening, then they’ll understand. Julie Stanford: Ed, have you ever had that conversation? Ed Carr: Every single sort of conversation, from the opening conversation you’ve referred to where something may have gone awry between one of your staff and one of the their staff, there’s been a misunderstanding somewhere and I think the answer to your question do you speak to them is absolutely yes. You have to speak to them before that little tiny spark turns into either resentment or a big old bonfire somewhere. I’ve had conversations with the clients which have gone along the lines of, “Look, I think there may be a misunderstanding between Joe in my business and John in your business because there’s something happening that I don’t quite understands. There’s been a process that’s gone wrong. A pricing structure’s gone wrong. Can we have a chat about it?” We’ve had a chat about it. The other side of that is when the relationship is starting to go wrong and perhaps you haven’t had the courage or the opportunity wasn’t there to air that opportunity, then it goes badly wrong and it ends up like any relationship that’s going bad and skewing in a big old bust up. We’ve had those as well. I’ve been doing this for 35 years, so we’ve had all manner of good and bad customers. We’ve had instances where we’ve had boardroom flare-ups because things have laid dormant for too long. We’ve actually sacked clients in the boardroom, but that’s partly our responsibility, too, because you’ve let it go for too long. It is a two-way street and as long as a value relationship’s there, then you can maintain that by open, honest, clear discussion. Julie Stanford: The thing is you have, though don’t you? If you don’t manage that process, you’ve got a time bomb ticking out there. Ray Richards: It doesn’t go away. Julie Stanford: Trashing you to all and sundry. Ray Richards: Everybody knows that it’s ticking and in my experience having those conversations and doing it in the right way. It’s not what you say, it’s the way you say it. It’s not what you say, it’s the way you say and you don’t do it in a threatening way and say, “We’ve got a problem. I’m sure probably the majority of the blame lies with us and I want to find out what the score is here.” You’re not making them feel inadequate in any way and you’re taking the brunt of it. Then it’s not threatening in any way and in my experience you have those good honest conversations and you actually come out stronger. Ray Richards: That relationship comes out stronger. Ed Carr: No, it’s not. Julie Stanford: For it to be really good business, as much as the relationships are personal because we are all when we’re talking to other human beings, when it comes to the essence of that kind of, I suppose the interface I’m thinking, it’s business and so it can be done. You can sort of take one step back and look at it quite coolly. I’ve said this before, but I thought I really grew up as a business owner when one of our clients who was really very rude to one of our lead designers and I just stopped one day, listening to him speak to her extremely badly and I just stood up and said, “I’m very sorry, but I am not prepared to hear you speak to her in that way and I’m afraid this is the last job we’ll be doing for you.” I realised I didn’t get cross. I didn’t say anything and I took him to one side to say it. I just realised that I was taking control of the situation, whereas up to that point I’d been a little bit sort of dragged here, dragged there by what the customer wanted. Ray Richards: I think you need to understand what the benefits of doing something like that are. You will have lost a customer. That’s not great and your accountant will tell you that’s a negative thing, but what you’ll gain is you’ll feel proud of yourself for starters, but you staff will turn around and say, “You stuck up for me. You value me.” It may be that you keep a couple of members of staff for another couple of years and they don’t move on to that next job because they’ve got this huge loyalty because they’re part of the team and they can trust you to stick up for them and you see that it’s more than just the bottom line for that small period. It’s not as simple as that. Ed Carr: I think there’s a couple of things that we could actually be doing to proactively encourage people to find the right customers and there’s two things. When you start this client relationship with anybody, it’s your choice, assuming you’re not desperate to get the business, you choice, so you can sit there and talk to this individual, this business, at any level that you actually work with them from boardroom down to cleaner, speak to them about what it is you’re expecting this relationship to be about. The second thing you’re doing is setting up right from the very, very beginning your expectations of this relationship as a supplier to your customer, what you’re expecting them to do, what sort of due diligence, what sort of relationship and you’re managing their expectations and you’re managing that relationship right from the off, so being clear about what drives you. Be clear in terms of contractual arrangements, too. Get your terms and conditions sorted. Put out every single thing inside of Ts and Cs and explain to them, “We’ve done these Ts and Cs because we’re in business, we want you to get the best out of us and we want to be able to supply to you in the way you want it. Read our Ts and Cs. Inside that it says the things that we want you to do and the things that we promise we will do like service level agreements.” As long as people understand that, you’ve got a platform against which to then judge what’s happening. Ray Richards: Although at the moment you can and buy something and pay three years later. Ed Carr: Or never at all. Ray Richards: A sandwich maybe. Julie Stanford: That you should pay. Yes. If their terms were cash on delivery. Ray Richards: I’ve tried to get 0% interest on sandwiches. It doesn’t work. Julie Stanford: No, but you never know at the time. Anyways, so you’re thinking then that we really should be thinking about interviewing the customer but finding out a lot more the due diligence per se. Ray Richards: Oh, absolutely. Check them. Julie Stanford: Find out whether we think they, and would you ring their other suppliers? Would you go that far if you could find out who they were. Ray Richards: You could, I think probably the best thing to do is just to sit down and have a conversation with them, have a good honest conversation with them. You’ll find out huge amounts. Julie Stanford: Sorry, I was just thinking then that then takes us onto your really, it’s an exciting concept of win-win. Ray Richards: It’s not mine. Julie Stanford: No, I know, but although you’d make a fortune if it was. Would you just define it really, because it’s a sort of no-brainer, it would be nice to have it defined. When you talk about win-win, Ray, what exactly tdo you mean. Ray Richards: What I mean is that both parties have to see the benefit. The interests are aligned. You have to understand if we do this we’re both going to succeed. Julie Stanford: Do you think that’s always possible? Ray Richards: Yes. I think longer term. Sometimes you have to take a hit in the short term and then they’ll repay that a few months down the line, a few weeks down the line, so sometimes it in that particular instance, it’s not always possible. I think it is generally always possible if both parties are subscribed to that concept and they understand why they’re doing it. Julie Stanford: Yes. Now, I find this notion very interesting that’s in this county, in the UK, I believe still that business is a bit of a dirty word. Julie Stanford: I think it’s wrong. Obviously some businesses behave appallingly, but in my experience, particularly with smaller businesses, most smaller businesses behave well and they are trying to do the best they can, not always, sometimes it’s a bit of a tortuous process, but actually mostly most people are trying to do the right thing broadly with their clients. Actually a lot of business owners earn a lot less than people earning salaries. Ed, do you think that’s true? Ed Carr: I think it’s true, but I hope that it’s getting less true because I think people are getting an understanding now of what they want to do when they go to work and what they want out of that thing when they go to work. It’s not like working in the industrial age where you go and sit at a spinning jenny for a week and earn threepence. People want to go to work to do something quite fulfilling so it’s getting actually more about being a human being and about being a human being is doing the things that you like to do, things that you value and things that other people value. So corporate values, it used to be entirely different from human values are getting slowly converged. The conflation of what human beings are about with what going to business is about is changing the way we all look at business. Julie Stanford: I do think it’s very interesting. I agree with you and I really genuinely think that the way we do business is changing for the better, but I’m not sure the perception of that is catching up. Just thinking then about your win-win situation Ray, the only problem with that is you do sort of put yourself in a vulnerable position. You have to be willing to be open and therefore in business terms vulnerable, don’t you? Ray Richards: Yeah, absolutely, but people love vulnerability. Why do we love Robbie Williams? Because he gets on a chat show and he tells you all these problems. He’s not trying to hid it. He’s human. He’s telling us he’s human and none of us are perfect. We’re all vulnerable. Ray Richards: I think it is brave. It’s unusual, but I think it pays dividends. You just tell the truth. Tell the truth. People know if you’re lying. They’ve just got a sixth sense. Their instinct is telling them, “Something’s wrong here.” They know if you’re lying. It’s something to do with your body language or where you’re looking. NLP [neuro-linguistic programming] practitioners will tell you they can spot it a mile off. I think for those people have got some good instincts, they just know. It’s not because they’ve studied NLP, but we know whether somebody’s lying or not and then it’s not as good a relationship. Julie Stanford: Do you think then, well I actually do believe this, that we’re all looking for authenticity. I think that’s why people like Nelson Mandela, Gandhi, all of those ring such bells with us and when we come across people who seem, they’re often flawed, they’re not perfect, but they are authentic and honest. I just think in business, I’m playing devil’s advocate here because I do wish we could all be like this. I just am not certain you can because I think everyone has to be playing by the same rules for it to work and I have had bitter experience where I’ve gone in being honest and vulnerable and then I’ve really come a cropper. Ray Richards: You do due diligence. Ed Carr: Yeah, it’s your job to find people that value those. Ed Carr: Value those values. Your job in your business is to maintain those relationships. Julie Stanford: But this isn’t just about, I’m not, forgive me because I’m not disagreeing at all, I’m just thinking that we’re talking as if the world is full of customers all waiting to come to us. Now we know that that’s not entirely true and we know that for a lot of businesses this would be something they might aspire to, but we might be being a little bit rosy, the rose-tinted glasses here. For some businesses, they just, especially nowadays given how things are financially, they have to take who they can take, and so maybe they do that whilst they’re looking for these holy grails of customers. Do you see what I mean. Ed Carr: Yes, I do, yeah, but I think this comes back to so many things we’ve already touched on here today and I think the honesty and the vulnerability is actually a strength. We’ve just gone through, if I can just tell you a story, a genuine living example of how a really nice relationship could actually have gone horribly wrong and it went wrong because we, in the contact we set up on one particular piece of work, which was a website, we didn’t specify exactly the percentages of importance to our customer of getting a particular customer to go to their website. We’ve listed all the criteria against which we judge the website, but we didn’t actually list the percentage importance of each criteria, so we read it in one way and they read it in a diametrically opposed way. Now that’s my fault. It was written by a member of my staff. I checked it. I agreed with what she had written, but I didn’t think like an accountant or some kind of forensic lawyer about the implications of not writing down an actually degree. Julie Stanford: And you can understand why you might not have. I could see how that one happened. Ed Carr: I looked at it, because we produced this piece of design, went off to the client phoned him up to say, “Hey, my design” and they said, “We don’t like it.” We were all shocked, all of us in the business and looked at it and thought, “What the hell have we done wrong?” We looked at it. We could have said, “Actually let’s go back to the contract, let’s rip you apart because you got it wrong.” We looked at and thought, this is actually our fault and I phoned the client the following day and said, “Look, I’ve got to apologise. We’ve looked at what we’ve created for you and we understand where this has gone wrong and two things are going to happen now. We’re going to do more work to get this back on track for you and the second thing is it won’t affect your budget. It’ll take a little bit longer, but it will actually be done exactly the way you want it and I want to apologize to you. We’ve never, ever, ever, misunderstood a client’s brief before” and I felt really good to do it. The staff, we’d spoken about our approach, we agreed to that approach and the client loves us all the more. I don’t think that was vulnerable. I think that was absolutely professional about what I do with my staff, my business and my client. I feel good about it. The staff are great about it and the client loves us. Julie Stanford: I think that’s a great story, but I supposed in vulnerability, I’m thinking about, you know, when I’m selling my product and I find out that someone’s buying it from me and then just really under cutting us because they know my costs, to me. I suppose I’m looking at it from possibly a slightly world weary view and I apologise for that. Julie Stanford: Like you I’ve been in business a very long time and I’ve had some wonderful customers and some that haven’t been so wonderful. Ray Richards: I think that there’s something in there about differentiation. You have to differentiate and I think these days there’s a real opportunity to differentiate through your values and explain what you believe in and so going back to what you said earlier, I think there is a massive move to businesses being seen as a force for good and not what they’ve been seen as in the past, which is greedy. Julie Stanford: Riding roughshod over people. Ray Richards: And not really caring about customers at all. Julie Stanford: Maybe that’s something to do with the rise of the small business, where that relationship is closer to the ground. We talk to our customers. Ray Richards: That’s frankly right, exactly right. I think what’s happening is if I talk to, I thought it was because I was getting older that my attitude was changing, but when I go and talk to 20 year olds in my business, then they feel exactly the same way as I do, if not stronger. Small business people feel the same way. They want to do something more than make money. What’s happened over the last couple of years has really had an affect on us all and people are leaving the city and they’re going to work for charities and that’s all great. When the recession is over, because it will be over at some point, it may not be next month, it may be next year, it may be in four years’ time, I don’t know, but I hope that the way people feel doesn’t change and they still want to do more than just make money. Julie Stanford: We’re coming to the end of this part of the show and I do like just to have a final thought from each of you if possible or a tip or something to leave listeners with in terms of good customer, bad customer. Ed, what would be your word of advice? 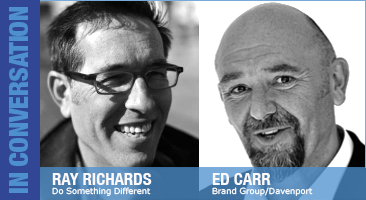 Ed Carr: To try to get it right from the start. They’re all potentially good customers if you filter out the bad ones, get an efficient process in place and that works on two levels, one human beings. We know if we like people or not. We’ve said body language. We’ve said the kind of NLP. We know if we’re going to get on with that person. If we think we can get on with that person and we set a proper legal contract from that point onwards, you’re better able to have an ongoing relationship that’s partnered and that’s a good customer. Julie Stanford: When we’re talking about the service level agreements and the terms and conditions, they really free you up. Julie Stanford: …where there could be arguments. Everyone’s agreed to it. A solicitor who was on a few weeks ago said also those terms and conditions need to be seen prior to billing. Ed Carr: Yes, I understand. Julie Stanford: They need to be accepted prior to invoicing, but just a couple of minutes, last thought Ray. What would be a tip that you would say really about this whole idea of good and bad customers. Ray Richards: I think following along from what Ed said, if you’ve done your due diligence and you think you’re working with the right person, even that sometimes it goes wrong, doesn’t it? We’ve all been there. You’ve ended up in an awful situation and the only way to deal with it is to be honest and just be completely straight, not be aggressive, maybe take some of the blame, suss them out and if at the end of all that, they’re still a bad customer, fire them. Julie Stanford: That’s the thing the win-win might well be, you both parting company, might it? Ray Richards: Absolutely. Yeah, they’ll find somebody else. So will you. Julie Stanford: Maybe you should warn the other person. As always, it’s just fascinating to hear people’s thoughts and ideas about business and there are so many subjects we can cover. Well, Ed, you’ve come on the show before and really it was great that you were able to come back. Ray, maybe you’ll come back again as well and talk on other subjects if you would. This show was originally recorded for business as usual on Radio Reverb. I’m Julie Stanford. Thank you for listening to Essential Business Radio.